I’ve read two Highsmith novels before: The Talented Mr. Ripley and Strangers On A Train. I loved the first, but found the second one to be a bit tedious at times. Both novels were cold, almost sociopathic books–ones that existed in worlds that contained little human kindness or honest feeling. It’s not even that the books were tragic–it’s that they weren’t tragic. Tragedy is a grand emotion, and The Talented Mr. Ripley had no room for grand emotions. Rather, everything in these books was sordid, stinking, petty, and cruel. And that’s cool! Small emotions need to get written up too! But given that, I’m pretty surprised by the vividness and honesty of The Price Of Salt. It’s a genuinely interesting, emotional novel. It’s about a department store clerk who’s drawn to one of her customers and, slowly, develops a romance with her. She’s a very compelling character. Not intelligent, perhaps, or even very thoughtful. But so sensitive and full of feeling! You simultaneously get the sense that she is too alive to be crushed by this world, and that she is SO alive that she can’t help but be crushed. You fear for her; you really do. In that, she reminds me a lot of the protagonists of all those other mid-20th century novels about lost souls: The Man In The Gray Flannel Suit and Revolutionary Road and On The Road and a bunch of other books that I’m probably forgetting. 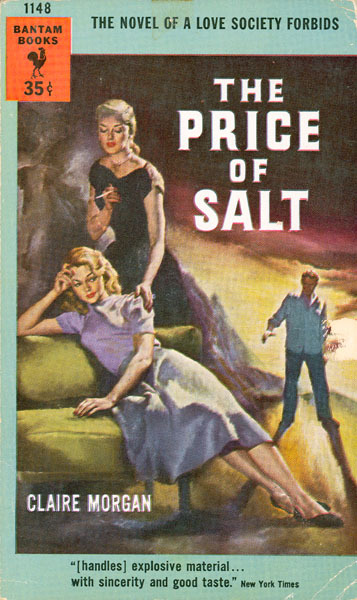 But The Price of Salt has its own spin on the tale, and that’s what makes it worth reading.